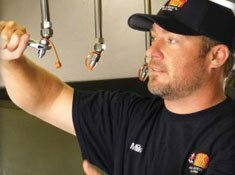 Amerex KP and ZD Kitchen fire suppression systems provide for higher nozzle placement and fewer nozzles while meeting all industry safety standards. When it comes to restaurant fire suppression, our competitors can’t come close to us, literally. For proof just examine the nozzle placement of our Zone Defense system. You might have to look carefully since our nozzles are tucked higher up in the hood than the competitor’s design. The Amerex KP systems are inherently more effective and use fewer nozzles. But don’t think that means our systems are less capable. In fact, our restaurant fire suppression systems meet all industry safety standards. Besides having higher nozzle placement, our fire suppression systems use less Wet Chemical agent thanks to an overlapping spray design (an innovation we pioneered). We don’t require you to route piping to an external source. With Amerex, the agent is in a nearby tank. Everything is self-contained for lower maintenance costs. Amerex Corporation has been manufacturing restaurant systems since 1995. Amerex is ISO 9001:2000 and ISO 14001:2004 certified. 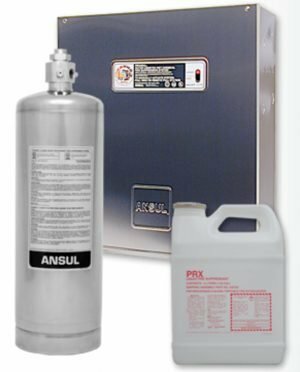 The Amerex pre-engineered wet chemical restaurant extinguishing systems are listed with UL per UL300 fire test specifications, UL of Canada per ULC/ORD 1254.6 – 1995 and LPCB (Loss Prevention Certification Board) – UK per LPS 1223 rev B. 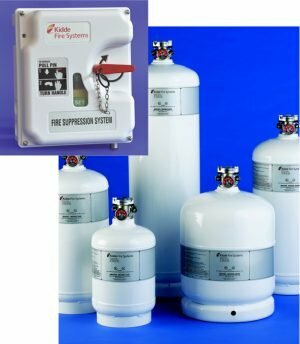 Stored Pressure Agent Cylinders – does not require filling in the field, avoiding additional costs and labor charges from the distributor doing the final hook-up. The agent cylinders are available in 4 sizes (Model 2.75, 3.75, 4.75 and 6 gallon). Listings with all major manufacturers of gas valves – allows the mechanical contractor to use the existing valves or purchase the valve themselves, avoiding lost valves and accessories. Amerex offers multiple types of detection – fusible links, linear fusible link and pneumatic tubing. 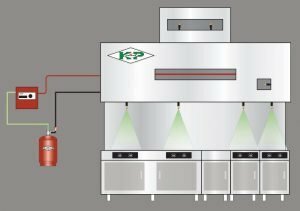 More flow points – The Amerex KP system can support up to 110 flow points without adding additional nitrogen cylinders or control equipment. Fewer nozzles – total of 7 different nozzles to inventory, less opportunity for mistakes in final installation, simplified system design. 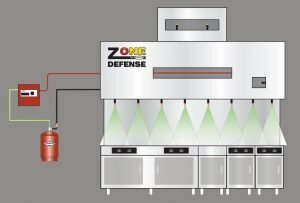 The Zone Defense restaurant system offers overlapping coverage with nozzles placed every 20 inches using fewer agent cylinders than the competition. Superior coverage – cover more appliances with fewer flow points, saves on agent cylinders, number of nozzles. Also, the largest fryer coverage on the market. Competitive pricing – some of the lowest costs in the industry for a total system installation. Remote MRM or PRM (control device) – agent cylinders can be located up to 100 feet away from the control head. Actuation line options – ¼” pipe, high-pressure hose or ¼” copper tubing can be used for the actuation line vs. ¼” pipe only. MRM or PRM (control device) mounting flexibility – Painted red enclosure, stainless steel enclosure, cabinet or OEM fabricated mounting. The system agent is Amerex KP liquid fire suppressant, a potassium acetate based solution that suppresses cooking grease fires through both saponification and cooling. The agent has a pH of 9 or less and will not harm stainless steel surfaces under normal conditions. 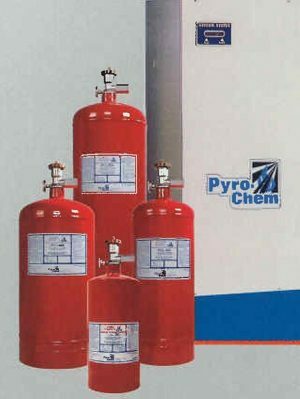 The agent cylinders are mild steel DOT 4BW 240 specification cylinders, tested to 480 PSI (3309 kPa). The agent cylinder/discharge valve assembly is fully factory charged with Amerex KP liquid agent and pressurized to 240 PSI (1655 kPa). The mechanical release module is the spring-loaded type using a mechanical input and electrical, mechanical or pneumatic outputs. It is capable of actuating from one to ten agent cylinder/valve assemblies using one nitrogen cylinder and is operated either automatically by the detection network or manually by a remote manual pull station. The MRM enclosure, available in either stainless steel or red painted steel, has a system status indicator and a window to observe the nitrogen cylinder pressure. The enclosure has provisions for applying tamper seals after final testing or periodic maintenance. The MRM enclosure has knockouts on three sides (top, bottom & right) to accept conduit. The MRM has two SPDT micro switches pre-installed. The link to link system consists of four major components – conduit connector, cable segment beginning and end, conduit box, and link to link cable segment. The link to link cable segment ensures that the links are equally spaced at 24” center to center for whole hood detection. The PRM offers superior detection by using a linear pneumatic detection system. The PRM detection system consists of the PRM, thermal responsive tubing and end of line fitting. The tubing is pressurized through a small “accumulator” inside the enclosure, routed throughout the hazard area. When exposed to a fire condition, the tubing ruptures, relieving all of the pressure in the tubing and accumulator thus firing the system using a nitrogen cylinder. The PRM comes complete with enclosure, accumulator, end of line fitting, and connector for up to two remote mechanical manual pull stations, two SPDT micro switch, and “knock-outs”. It is capable of firing up to 10 – agent cylinder assemblies and actuating up to two gas valves. The tubing is sold separately and is cut to length. Stainless or red enclosure. The actuation cylinder is filled with 10 cu. in. of nitrogen and has an integral pressure gauge that allows easy field verification of pressure. This cylinder shall be capable of being refilled in the field by an Authorized Amerex Zone Defense Systems Distributor and shall not require periodic hydrostatic testing. An enclosure housing an MRM and one agent cylinder is available. The pressure gauges for the nitrogen cylinder and the agent cylinder are visible without removing the front cover of the cabinet. Also available in a stainless steel single agent cylinder enclosure. The agent cylinder bracket is steel, painted red. Discharge nozzles are made of chrome-plated brass, and shall consist of a one piece tip/body, strainer and blow off cap. Agent discharge piping for the Zone Defense system shall consist of nozzles placed no further apart than 20 inches the entire length of the hood creating an overlapping nozzle spray pattern which permits movement of the protected appliances such as fryers, woks, ranges and char-broilers, without altering the Zone Defense discharge nozzle locations. Specific appliance coverage can be used where necessary. The manual pull stations are a “dual action” type. Both a ring pin and lever must be pulled in order to discharge the system manually. A mechanical gas valve, specifically listed by UL for use with the Amerex Zone Defense system, shall be installed for automatic shut off of gas whenever gas appliances are used. The valve has a “pull to close” design requiring a pull force to trip a latch that holds the valve in the open position. The cover of the gas valve has a visual indicator showing the valve’s state of readiness. The Amerex mechanical gas valve body is made of brass and is UL Listed for both natural gas and propane. Existing mechanical valves, if operating, may be used according to the listed Zone Defense Design, Installation, Maintenance and Recharge Manual. If an electrically operated gas valve is required, it must be UL Listed for use with the Amerex Zone Defense system. The use of a UL listed manual reset relay is mandatory to prevent unmonitored gas flow due to power outage. A micro switch mounted in the PRM is used to control the closing of the gas valve at the moment of system actuation. UL listed electric micro switches are provided to accomplish system output functions. The switches are “stackable” inside the PRM without requiring extra mounting hardware. From one to four sets of dry form “C” contacts are available. 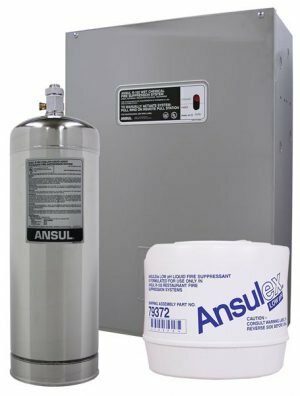 With the Amerex KP Restaurant Fire Suppression System you get appliance-specific coverage that typically offers lower initial cost. The KP system is ideal for uses where appliance location is fixed such as in fast food chains, casual dining, cruise ships and school cafeterias. The Amerex KP Restaurant System is a pre-engineered, wet chemical, stored-pressure type with a fixed nozzle agent distribution network. The system is listed by Underwriter’s Laboratories, Inc., ULC and tested to U.L. Standard 300. The system shall be designed, installed and maintained in accordance with: Amerex Part No. 20150 “Design, Installation and Maintenance Manual”, N.F.P.A. 96, N.F.P.A. 17A, local codes and ordinances by an Authorized Amerex KP Systems Distributor using factory trained personnel. The Amerex ZD Restaurant Fire Suppression System adds greater flexibility by letting you reconfigure a kitchen or move appliances without moving nozzles. Because of its adaptability, this system is the most cost effective choice over the life of the system. The ZD system was designed with fine dining, culinary schools, military facilities, hotels and hospitals in mind. 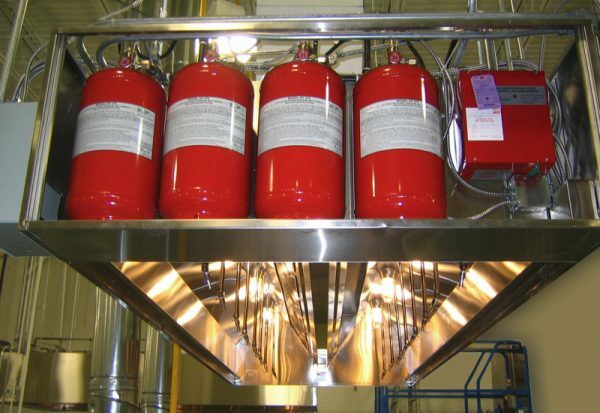 The Zone Defense Restaurant Fire Suppression System is a pre-engineered, wet chemical, stored pressure type with a fixed nozzle agent distribution network manufactured by Amerex Corporation. The system is listed by Underwriter’s Laboratories, Inc., ULC and tested to UL Standard 300. The system shall be designed, installed and maintained in accordance with: Amerex Part No. 20150 “Design, Installation and Maintenance Manual”, N.F.P.A. 96, N.F.P.A. 17A, local codes and ordinances by an Authorized Amerex Zone Defense Systems Distributor using factory trained personnel. The Zone Defense system is fully self-contained and does not require electrical power or connection to either domestic water supply or fire sprinkler supply lines.